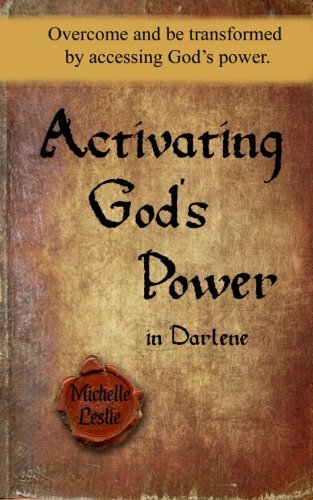 Activating God&#39;s Power in Darlene: Overcome and be transformed by accessing God&#39;s power. Do you want to pray with power... and see results? Readers of Activating God's Power by Michelle Leslie will learn what to pray and to confidently claim answers to prayer. This personalized book is a guide to praying according to God's Word! You will discover hundreds of Scripture-based prayers for all of life's situations: from finding your identity in Christ, to awakening God's favor in your life, to overcoming the trials of life with spiritual warfare. When we meditate on the word and speak it, we are activating God's power. God's word brings life and creates a spiritual mindset that changes us and the world around us (Romans 12:2). As you put these mighty, scriptural prayers to work in your own life and in the lives of those around you, you will see God moving and activating his Word. You no longer need to feel helpless in the face of difficult or painful circumstances. You no longer need to miss God's blessings for you and your loved ones. You can pray with power! Nothing is more powerful than God. With Activating God's Power we are praying God's Word to overcome and bring us the freedom only found in Christ. Activating God's Power is a must-read for anyone who wants to pray with strength and purpose. The faith produced from this book will lead to results, not just for ourselves but for the lives around us. Michelle Leslie was raised in rural Oregon. She is a pillar of activation within the Body of Christ with a heart to hear God&#x2019;s word and see it lived out as her calling and destiny. Along with her gift for challenging people to be all they were created to be in their life, she is a fun-loving, hard-working, creative friend, daughter, mom, and wife. As a child, Michelle was dyslexic. Because of her trouble learning to read, she struggled through every subject in school and was doomed to special education classes (which she perceived as &#x201c;social suicide&#x201d;). When Michelle came to know the Lord in her early twenties she was desperate for God&#x2019;s word. As she dove into the word of God, her life changed dramatically. Romans 12:2 was in full effect, and Michelle was transformed by the renewing of her mind. The effects of the learning disability that had held Michelle back her whole life were slowly diminishing. Michelle was finally reading and retaining information, growing in confidence, and developing a voice for the message God had given her to share. God&#x2019;s power was being made perfect in her weakness, and through this platform God demonstrated his love and transforming power to those around her. Michelle has a deep desire for others to experience the transformation and freedom that can only be found in Christ, and she is sharing it with all who will listen through this extraordinary upcoming book, Activating God&#x2019;s Power. Michelle is writing in the hope of meeting the needs of readers in desperation, or those who are seeking spiritual growth in themselves or in their loved ones. Michelle lives in Denver, Colorado with her husband and two daughters.